This month's Foodie Extravaganza theme was chosen by Caroline of Caroline's Cooking. She went over to The Nibble and learned that April is National Garlic Month. We love garlic around here and I use it in nearly every recipe. I even have a few in which garlic is the star ingredient. These Garlic Pull Apart Rolls are so very delicious. We also love smearing Lebanese Garlic Sauce onto hot pita breads. This scrumptious Chicken with 40 Cloves of Garlic is an easy crockpot meal. We also enjoyed garlic as the star in this Soup with Noodles and Peas. You could serve them up with these Garlic Knots that are one of my husbands favorites and follow it up with Garlic Brined Pork Chops, which is one of mine. Whenever we go out to dinner, my husband will ask for Creamy Garlic Dressing on his salad. Rarely do they have it but every once in a while he gets lucky and then he is a happy camper. Caroline announced this theme shortly after we had been to a restaurant who looked at Frank like he had 2 heads when he asked for Creamy Garlic dressing. I decided that I was going to find a Creamy Garlic Dressing recipe that I could make for him to enjoy at home. I greatly adapted this recipe that I found at the Taste of Home website. The original recipe was made with low fat and no fat ingredients. I didn't have those on hands. We are also a Miracle Whip family but if you are a mayo person, have at it. I had no scallions so I omitted them. The first day, I used it to dress a flat bread pizza. That recipe will be forthcoming. Since then Frank has had salad nearly every day. I should have made this dressing ages ago. After the third or fourth time he had it he told me that it was better than any Creamy Garlic Dressing he had ever gotten in any restaurant. Of course, that comment had me running into the kitchen to make up another batch!! I'm anxious to see all the rest of the Garlic recipes being shared today. You will find links to all of them following this quick and easy recipe. 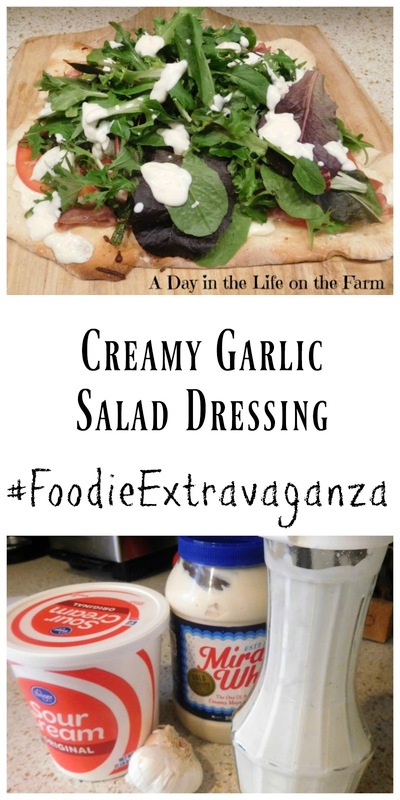 I can't wait to make this- We always have salad and I get bored with my vinaigrette- love this creamy, garlicky version. Your husbands' approval sort of sold me though to be honest! I always love a good DIY salad dressing.I bet this one would be fabulous on slaw. And with summer coming up, this recipe could be quite busy! I'll bet it would Sue. Thanks for the idea. Homemade dressing is the best! Can't wait to give this one a try. Sounds tasty, I can imagine this going with lots of things. Yes...garlic is the best Caroline. That's what I thought Stacy. OMG, I am a Miracle Whip person, and my husband is a Mayo person! Can't wait to try this! I think it can be made with either and still taste amazing Karen. I just love that someone else came out of the "Miracle Whip" closet, lol! This will be a nice departure from my usual oil and vinegar. Thanks for the inspiration! He really loves this post. I'm always happy when my post is liked. Looks too good and a homemade dressing is any day better than bottled one.